We’ve all felt the pure joy of watching inspiration scenes in movies. The character has an emotional moment that resonates with us because of how real it all feels. Inspirational speeches have been a hallmark of great films since the “talkies” first arrived on the scene. Deciding which scene is the best of all is a debate that never ends. There’s no way to be completely right, but there are certain inspirational scenes in classic movies that stand out as perfect examples of the genre. The 20 scenes mentioned in this article have stood the test of time and still inspire viewers, no matter how long the movie has been out. Gladiators faced innumerable challenges in the arena. When a motley crew of fighters is ready to be sent to their deaths, General Maximus explains how to increase their chances of survival. He implores them to work together “as one” to overcome the horde of enemy combatants. 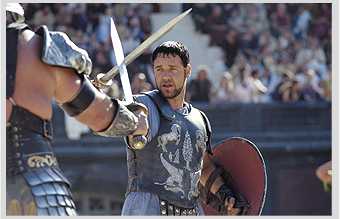 Maximus makes some inspirational speeches in the film “Gladiator,” but this one stands out for its bright, motivational message. Gladiator as an entire film is gripping. Follow along with Maximus as he continues to fight for his freedom against all odds, and you’ll be cheering for him by the end. 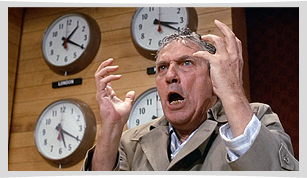 Network, a classic movie, features a speech by Howard Beale that is shocking and inspirational in its way. Beale reveals the sordid secrets behind network television to his vast audience. In doing so, he tells people to get “mad as hell” and not take it anymore. Beale is attempting to inspire his vapid followers to wake up to the illusionary world of TV programming so that they can get on with their lives. It’s not how hard you hit that matters in life, explains Sylvester Stallone to his son in the 2006 movie “Rocky Balboa.” What is important is that you keep getting back up, ready and willing to fight another day. Rocky has always delivered his share of inspirational messages in movies. This one, however, has stood the test of time and still shows up on everyone’s short list because of the message to never to give up. Sylvester Stallone has been criticized throughout his career for his over the top performance. 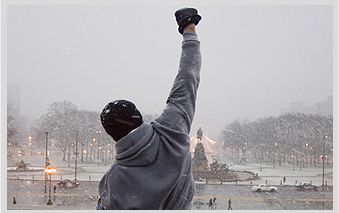 Despite those who disapprove, he created one of the most inspirational movie characters of all time with Rocky Balboa. Al Pacino explains the importance of fighting for four quarters to his team of overly emotional, overpaid NFL players. This film has multiple themes, the most dominant of which teaches the lesson of teamwork. The wily coach mentors standout Willie Beaman until the young football player finally understands that he’s not alone. 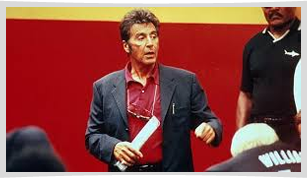 Oliver Stone does an excellent job of shooting a rousing “halftime speech.” Superior football coaches must be able to deliver inspirational speeches to keep their team fired up, and Pacino makes it look easy. 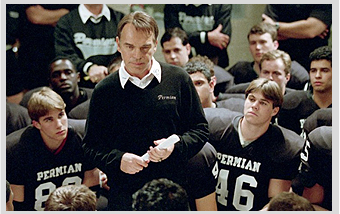 Long before Friday Night Lights was a favorite TV show, it was a movie starring Billy Bob Thornton as an inspirational high school coach who wanted to change the hearts of his players as well as win football games. In this speech, he lets them know that they don’t have to be perfect, as long as they put in an honest effort. Thornton’s character teaches them a life lesson that is even greater than the high school football championship. 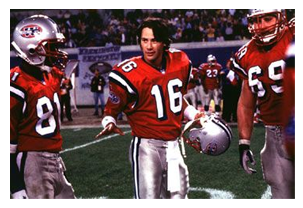 Keanu Reeves is heading up a group of replacement strike-breaking football players who are going up against the real talent. Reeves delivers an inspirational speech that is known for its brevity and wit. “Pain heals, chicks dig scars, and glory lasts forever” is all he tells the team. It’s enough to inspire them up to play their best football ever. This speech proves that it’s not always the word count that matters. Instead, movie lovers resonate with this statement because it sums up the main point of playing hard for everyone. 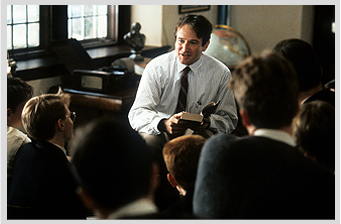 Robin Williams plays a teacher who is out to inspire his students. He lands on the idea of explaining to them the meaning of the Latin phrase “Carpe Diem,” which means “to seize the day.” Inspiration helps others make decisions about how they want to live. For young students, accepting the idea that they can do whatever they want in life is a powerful motivator. This movie remains on the lists of best speeches ever because of the emotional impact. Rudy is feeling down. Despite his repeated efforts to play his way into a game of football for Notre Dame, he’s running into resistance to his diminutive stature. Charles Dutton, who has befriended the plucky lad, offers him a stirring speech to motivate him to continue his quest for greatness. 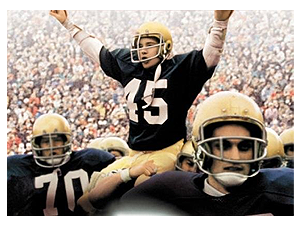 Dutton’s character quit playing football, despite having much more natural talent than Rudy. He implores Rudy to keep going, no matter what. That inspirational message works for Rudy, and for fans of the feel good movie. Rudy gets to live his dream after all. He never becomes a star player, but he manages to make a great play in front of the people he cares about most. David beats Goliath in this upbeat movie. 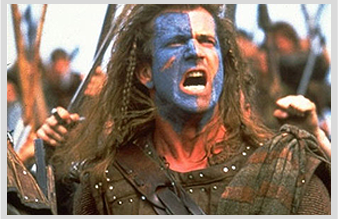 Mel Gibson inspires the Scots as William Wallace. In his blue and white face paint, the Australian gives a convincing performance as a man who leads a downtrodden people against a superior enemy. Freedom is the banner he rallies the troops behind. By the end of the speech, the warriors, and the movie audience, are ready to battle anyone who stands in the way of their freedom. Gibson has had his share of run-ins over the years that people haven’t enjoyed, but this particular movie scene rates high on the charts for its ability to inspire. A rousing speech during times of impending battle is a movie-making tactic that continues to delight audiences everywhere, and this scene is an example of how to do it well. Another classic movie that ends with an emotional bang is “It’s a Wonderful Life” starring James Stewart as George Bailey. Bailey made the mistake of “wishing he’d never been born” earlier in the movie and now realizes what a bad mistake his nonexistence was. Bailey led a treasured life, and influenced the people in his town and family. He realizes at the end that family is what matters as he enjoys Christmas for all it’s worth. 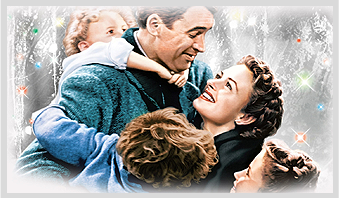 This classic film plays around the holidays every year, earning the respect of countless movie buffs. George picks up a book from his angel with the inscription, “No man is a failure who has friends.” George, and the audience, once again discover the real meaning of Christmas. Coach Carter has had a tough time motivating his team. He treated them firmly but fairly throughout the movie. 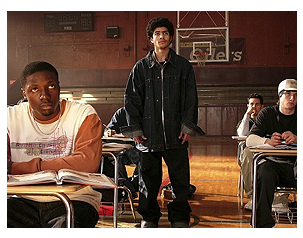 During this pivotal scene, his players rally around him and read a poem by Marianne Williamson called “Our Deepest Fear.” Despite his overbearing demeanor, the young men on the team learned to respect themselves and to admire Coach Carter for his tenacity. The movie, which stars Samuel L. Jackson, is based on the life of Coach Ken Carter. Carter taught that having pride in what you do is something that will get you through any struggles you have. This scene is powerful enough to inspire to this day. Oscar Schindler undergoes a personal transformation of extreme proportions. He gives up on the idea of living a comfortable life as a Nazi sympathizer to throw his fate in with his Jewish workers. He does everything in his power to save as many of them as possible. One grateful employee tells Schindler about the saying in the Talmud that one person “who saves one life saves the world entire.” The outpouring of support he receives moves Schindler deeply, but he feels like he could have done much more. Those who were touched by his efforts let him know he did more than enough. 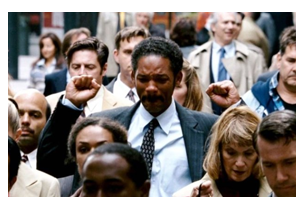 This scene inspires all who see it understand that the actions of one person have a profound impact on others. 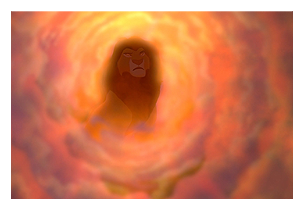 Simba is under pressure and has to rally to save his way of life. During this pivotal time in his story, he has a vision of his father, who tells him to “Remember who you are.” Simba takes this advice to heart. Since his father was brave and forthright, he’s inspired to have the same qualities. This Disney animated movie was influenced by “Hamlet” by William Shakespeare, so it has plenty of heavy-duty emotions for viewers to enjoy. Simba has to take control once again of Pride Rock, something he does to the delight of his close friends. Once he remembers his origins, he is able to overcome challenges and eventually triumph. 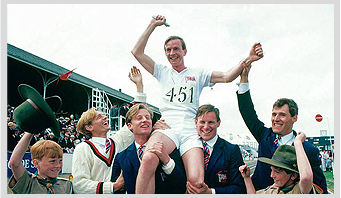 Chariots of Fire has held up well over the years, primarily because of the upbeat message it delivers. Eric Liddell finds his interior power and uses it to push himself to champion status. Liddell in this scene reveals that he runs because he loves it and because he’s fast. He’s confident that running is his unique talent, so he pursues his passion with gusto. The message is clear for filmgoers. Follow your dreams, work hard, and, before you know it, you will have a chance at becoming a champion. That message is the definition of inspiration, and the scene and movie still do the job of psyching up viewers. 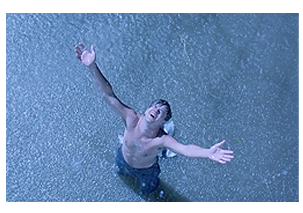 Andy Dufresne escapes from prison, and movie fans feel a rush of relief and inspiration. This scene is iconic. Dufresne basks in the rain because he’s feeling it against his skin for the first time since his serious troubles started. He’s free again, and the taste of freedom never tasted so sweet. Dufresne inspires people because he never gave up on himself, despite the odds he faced. Andy undergoes so many hardships during his time inside that seeing him escape with his arms outstretched heavenward is a sight that lingers long after viewing. When you’re a Spartan, and King Leonidas gives you a rousing speech about glory, you’re ready to burst into battle. 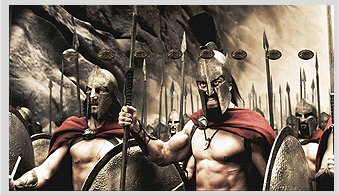 Leonidas, played by Gerard Butler, explains that there is no retreat and no surrender for Spartans. That is the law of the land in the ancient Greek city-state, and 300 Spartans should be enough to defend their turf, he tells his followers. After he’s done inspiring them about their mission, they accept the challenge and rise to defeat their bitter enemies. 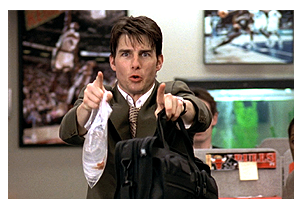 Tom Cruise puts in an effort as the agent who tries to rally his coworkers to defect from their current employer to start a new agency with him. Cruise’s character has had an epiphany. He realizes he wants his life to be about something fun and inspiring. 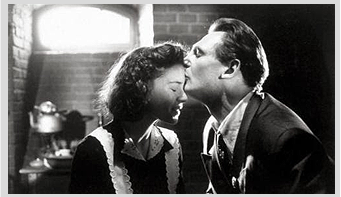 His speech is brilliant, but only inspires his loyal secretary, Dorothy Boyd, to go on his new journey with him. Lucky for him, she goes on to become his wife. The whole film serves to inspire film fanatics. It teaches the audience to follow their dreams, even if it means leaving a comfortable situation for the unknown. 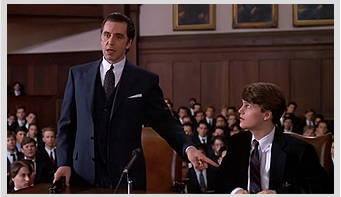 Al Pacino delivers a powerful performance in this movie, especially during a dramatic court scene. The blind military man goes to bat for his young friend Charlie to ensure he gets fair treatment in court. Frank inspires the audience because he’s interested in doing the right thing, regardless of how unpopular it makes him. His actions have quite a profound impact on Charlie, who needed someone on his side. The audience is reminded just how important ethics and fair dealing are to someone who is under indictment. Mickey Rourke gives an emotional performance in “The Wrestler.” He’s sticking with wrestling, no matter what price the sport has made him pay. His final words are him telling the audience that the only way he would ever quit is if they wanted it. 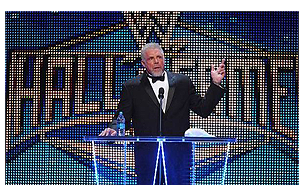 He considers wrestling to be his whole life, and the fans of the sport to be his only family. The scene is very inspirational for anyone who has ever stuck with a dream that others deemed unimportant. As it turns out, inspiration can be found nearly everywhere in popular movie themes. These movies are just a few examples we think are noteworthy.